Mouse anti Human S100 Protein antibody, clone 6G1 recognizes S100 protein derived from human brain tissue. It is a ~21 kDa acidic calcium-binding protein synthesised by astroglial cells. It can be found predominantly as two isoforms, the alpha-beta heterodimer (S100a) and the beta-beta homodimer (S100b). The S100 family of proteins have been implicated in a large variety of intracellular and extracellular regulatory activities, such as cellular energy metabolism, cytoskeleton modification, cell proliferation and differentiation. When glial cells are damaged, S100 protein is leaked into the extracellular matrix and cerebrospinal fluid, further releasing into the bloodstream. As such, S100 protein can be used as a sensitive and reliable marker for nervous system damage, such as after brain damage or acute stroke.  Mouse anti Human S100 Protein antibody, clone 6G1 recognizes both S100a (alpha-beta) and S100b (beta-beta). Mouse anti Human S100 Protein antibody, clone 6G1 is sensitive to EDTA and other bivalent-binding agents. Better performance can be obtained in the presence of 5mM CaCl2 in assay buffers. Paus, E. et al. (2011) TD-11 workshop report: characterization of monoclonal antibodies to S100 proteins. Tumour Biol. 32 (1): 1-12. Wang, Q. et al. (2012) Evaluation of human brain damage in fatalities due to extreme environmental temperature by quantification of basic fibroblast growth factor (bFGF), glial fibrillary acidic protein (GFAP), S100β and single-stranded DNA (ssDNA) immunoreactivities. Forensic Sci Int. 219 (1-3): 259-64.